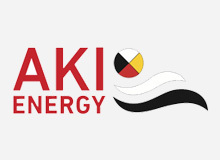 Winnipeg-based Aki Energy is an award winning non-profit First Nations social enterprise that has used an innovating on-bill financing system to install $7 million in geothermal heat pumps on 5 Manitoba First Nations since 2013. Aki also has been working successfully to replace diesel fuel used for space heating at the Northlands Densuline First Nation with biomass and lake based geothermal. Aki has a healthy food strategy focused at the Garden Hill First Nation that includes a 13 acre farm, poultry operation, orchard, and a revival of the fishing industry. COS is supporting the local social enterprises in this area and is ready to assist Aki in their efforts to widely replicate its success in northern Manitoba. Read more about Aki Energy.